SPECIAL OCCASIONS – BY REQUEST. At Portland Spiritualist Church a very friendly welcome awaits you when you come through our doors. We may be the newest church in the area but what we lack in age we more than make up for in hospitality. Our founder, Val, knew many years ago that she was to open a spiritualist church but at the time had no idea how this was to come about. After a lot of hard work, and keeping her eyes open, an opportunity finally presented itself and the rest, as they say, is history. 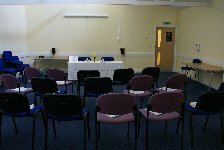 We opened our doors as a spiritualist church for the first time in March 2011. Since that time we have seen our congregation steadily grow. We are totally Independent. Mediums come from all over to give demonstrations at our services and we strive to create a welcoming and friendly atmosphere. Everyone is welcome no matter what colour or creed. Because we share the St. John Ambulance Hall, not having our own building at present, our doors cannot always be open. Please see the diary page for a full list of our services. We also put on special events and training days. These are also included on the diary page. © Copyright Two Worlds Combine | Portland Spiritualist Church 2012. All Rights Reserved.